In fact, I'm pretty sure that the US (and Canada) is the worst market for unlocked phones. The lack of a standard like GSM and the inertia of 2-year contracts make it difficult, as you say. However, that is the excption. Most of the global phone market is off-contract, so Google has a chance here. The Google Play site is at the top bar of the browser every day for hundreds of millions of people, so this could be the online store with the biggest audience. And for people who are already on Android, you can check out a new app and then a new phone, for example. T-Mobile's Value plans, with no phone subsidy, are generally cheaper than the traditional subsidized plans. So you CAN get a cheaper plan to use with this phone. You can buy this phone and use it with a prepaid plan that is a LOT cheaper (Eg: Simple Mobile and Straight Talk) for unlimited everything, compared to AT&T, Verizon or T-Mobile plans. These prepaid plans are from T-Mobile and AT&T MVNOs. So, they are perfectly suited for this phone. That would make the total cost of ownership of this phone, over 2 years, very competitive compared to other phones you get subsidized from carriers. This deal from Google will cost me $435.83 with shipping and tax. A couple of weeks ago, I saw this phone for $429 with free shipping and no tax from Amazon.com. I fully expect this to be available soon for cheaper than Google's store on Amazon.com. I think Samsung milked this phone for as much as they could from the carriers till now. That is why they did not let Google sell these phones. Now that the release of Galaxy S3 is imminent, they must have figured that they could milk this device some more through the Google store cuz there are many people who like to buy a Nexus device directly from Google. Google would have sold a LOT more phones if they offered it through their store a few months ago at a competitive price. Google has a bad track record of being able to negotiate with hardware/carrier partners. They need to roll this out to over countries. £250 for a Galaxy Nexus? I barely use calls and texts, there are phone companies in the UK that sell 500MB a month (about average what I use, most of my data is over Wifi) for £5. I'd save a ton of money! The Galaxy Nexus is a really grat phone and excellent value for money, my son has one he loves it. 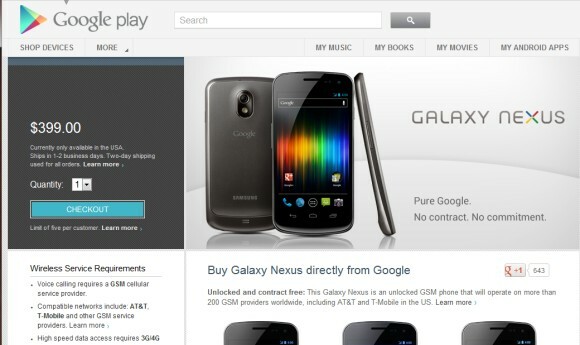 Wow, I have my old HTC phone but I am thinking about getting this new Nexus one, I wonder, is it a good choice? To the commenter above, dont buy HTC, go for Nexus, its awesome!! !